George III (George William Frederick; 4 Juin 1738 – 29 Januar 1820) wis Keeng o Great Breetain an Ireland frae 25 October 1760 till the union o the twa kintras on 1 Januar 1801, efter which he wis Keeng o the Unitit Kinrick o Great Breetain an Ireland till his daith. He wis concurrently Duke an prince-elector o Brunswick-Lüneburg ("Hanover") in the Hsly Roman Empire afore acomin Keeng o Hanover on 12 October 1814. He wis the third Breetish monarch o the Hoose o Hanover, but unlik his twa predecessors, he wis born in Ingland, spoke Inglis as his first leid, an niver veesitit Hanover. His life an wi it his ring, that war langer than thae o ony o his predecessors, war merked bi a series o militar conflicts involvin his kinricks, muckle o the rest o Europe, an places forder afield in Africae, the Americaes an Asie. Early in his ring, Great Breetain defeatit Fraunce in the Seiven Years' War, acomin the dominant European pouer in North Americae an Indie. Houiver, mony o Britain's American colonies war suin lost in the American War o Unthirldom. Forder wars against revolutionary an Napoleonic Fraunce frae 1793 concludit in the defeat o Napoleon at the Battle o Waterloo in 1815. In the later part o his life, George III haed recurrent, an eventually permanent, mental illness. Awtho it haes syne been suggestit that he haed the bluid disease porphyria, the cause o his illness remains unkent. Efter a feenal relapse in 1810, a regency wis established, an George III's eldest son, George, Prince o Wales, ruled as Prince Regent. On George III's daith, the Prince Regent succeedit his faither as George IV. 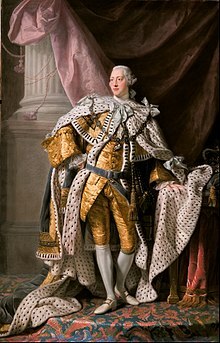 Historical analysis o George III's life haes gane throu a "kaleidoscope o cheengin views" that have dependit hivily on the prejudices o his biografers an the soorces available tae them. Till it wis reassessed in the seicont hauf o the 20t century, his reputation in the Unitit States wis ane o a teerant; an in Breetain he becam "the scapegait for the failyie o imperialism". ↑ 1.0 1.1 24 Mey in the Auld Style Julian calendar in uise in Great Breetain till 1752. ↑ "George III". Official website of the British monarchy. Royal Household. Retrieved 18 April 2016. This page wis last eeditit on 8 Februar 2018, at 22:55.